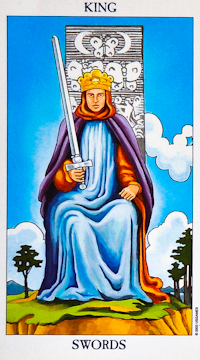 The King of Swords is one of the Court cards in the suit of Swords in the Minor Arcana of the Tarot. All the Kings of each of the four suits in the Tarot often indicate an actual person. The Kings are often said to characterise the quality of a mature, wise man. He is mature but expresses it through authority and assertiveness. You know where you stand with the King, for he says exactly what's on his mind. Kings have passion and drive and don’t hold back in offering their advice. They are concerned with results, outcomes and consequences. The suit of Swords is connected with intellect, thought and reason. It belongs to the element of Air, the colour yellow, the season of autumn or fall, the direction of east and the timing of dusk. The astrological corresponding sun signs are Gemini, Libra and Aquarius. The key words connected with the suit of Swords include analysis, articulation, cleverness, direction, ethical, forthright, honest, incisive, intellectual, knowledgeable, literate, logical, moral, quick-witted and well-informed. The King of Swords Tarot card meaning usually indicates the need for clear thinking, straight talking, honesty and forthrightness. Physically this card describes a man with brown hair and grey or green eyes. The King of Swords can be a warning card in Tarot Readings and shows the truth will be revealed. It can also show thinking about new ideas, getting thoughts down on paper, giving projects and ventures a lot of thought. The King of Swords, as with all the Court cards can be a representative of an individual or aspect of a personality. The meaning for this card can describe a man who is a patient, careful man, with very high ideals. He is eloquent, articulate and uses his intellect wisely. Above everything he is firm but fair. He is a very good communicator and can debate well recognising the other side of every argument. He can be distant and difficult to get close to. When this card appears in Tarot Readings concerned with love and romance it usually indicates a need for a more equally balanced and fair relationship. If you are doing too much of the giving and taking too little in return this card can show a need to use your sword and cut through any unfairness, inequality or deception. If you are single this card can encourage you to be honest and truthful from day one of any potential relationship. 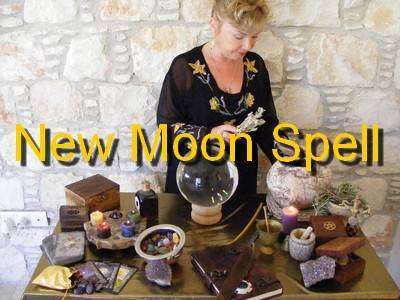 The Tarot card meaning for questions concerning career or business in Tarot Readings often represents needing to impress and make an impact with a brown haired male boss. Be totally honest and up front in your dealings with this man. 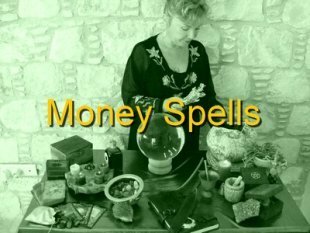 The King of Swords Tarot card meaning for questions related to money and finance usually acts a warning to find the complete truth in money matters. It warns about researching rationally and objectively before signing paperwork. This card can also concern legal matters relating to money matters such as payouts, compensation or awards. When this card appears in Tarot Readings concerning health and well being it can show a need for a new and objective health assessment. You may need to seek a new doctor or second opinion. If the King of Swords is prominent in a Tarot Spread it can show that the ability to see problems objectively and find new and better solutions will be discovered. This card can indicate a need to take full control over your life without undue influence of others. It is about acting and reacting objectively without emotion. I use Tarot cards from the Suit of Swords in my Protection Spell casting for protection, cleansing and ridding negative energies. If you want to change your destiny for the better then use the power of Magic Spell Casting to make things happen!! !